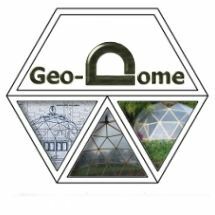 Here's a dome design with a difference, based on a space helmet the panels are not triangle as in geodesic dome design but trapezoid - each panel is an isosceles trapezium to be exact. This has some advantages when cutting sheet material, laid top to tale the panels will easily cut from square sheet material. There are only five different shaped panels in this design, making for a simple DIY build using the hinged panel construction technique. The drawings below show front, side and plan elevations with the grey square measuring about 1 meter. 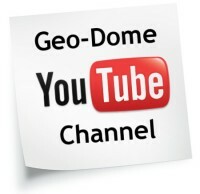 The dome itself measures approximately 11 meters in diameter and 5.5 meters high. 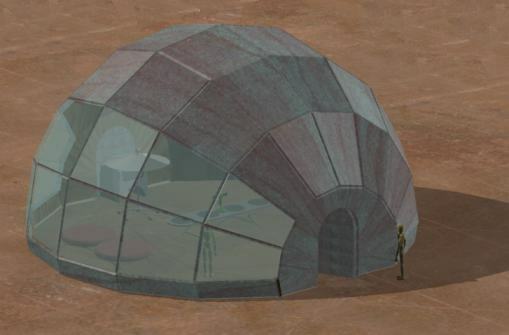 This dome design is well suited to conventional building techniques and materials, it would be simple to place standard velux windows in the roof panels, building doors is also very straight forward in either of the semicircular vertical side walls. Very interesting design. 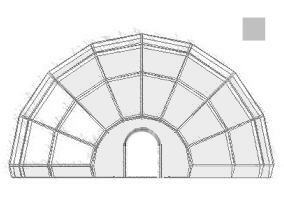 I am thinking that if I extend this dome by inserting purely rectangular panels in the centerline, I could get the elongated pool cover structure I am seeking. Do you have any more details as far as angels, panel dimensions etc? Here you go Jeff,I've made a page with a bit more information about trapezium paneled dome design. 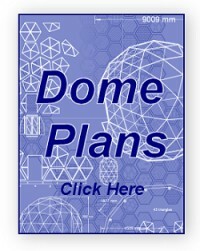 This is very interesting, as this fits with the request i made before regarding an elongated dome - this looks very do-able. I am looking at the pool cover design, as a possibility for a trailerable (8' wide or less) electric/solar houseboat. I ma looking for low wind resistance on land and water. My plan is a 8' wide 12-20' camper on a set of pontoons (24 foot). The boat needs to function as a land and water camper. I would need doors on the bow and stern (may be roll up), and windows for the sides and helm. I think I can build it, the skin is in question, but I am not sure how to design it? How to start. Any help would be appriciated. Technically I think this sort of webbing would be called a `conjugate graticule` layout... I think... I'm just being an uber-nerd - I actually love the name, it has character! this is a very cool design. 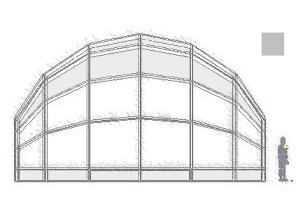 you state that - There are only five different shaped panels in this design. 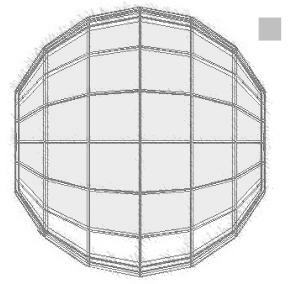 ok, just what are the panel shapes (dimensions)? thanks.